EAST SETAUKET, N.Y. (Sept. 6, 2017) – Raising awareness at the local level can make a big difference for Wounded Warrior Project® (WWP). That support allows WWP to provide its programs free of charge to the warriors it serves. And that support comes from individual supporters, corporate partners, and even groups of students. 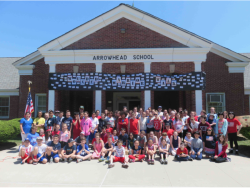 Recently, the entire 6th grade class of Arrowhead Elementary School showed its support for WWP. Dan’s father and father-in-law both served in the Navy, with his father-in-law serving during World War II. While they were never able to directly benefit from the programs and services that WWP offers, Dan saw a chance to show how it benefits others. Arrowhead Elementary’s fundraiser was called “Walk 4 Warriors.” Students created flyers to educate people about how WWP serves warriors and gather donations from interested supporters. During the event, the entire school came together, and the local parent-teacher administration provided lunch and water for the walkers. Students of any age can support WWP through the Student Ambassadors program. To learn more, visit https://www.woundedwarriorproject.org/give-back/students. And to learn about how that support funds WWP’s programs and services that connect, serve, and empower wounded warriors, visit http://newsroom.woundedwarriorproject.org.